26 1/8 x 32 7/8 in. 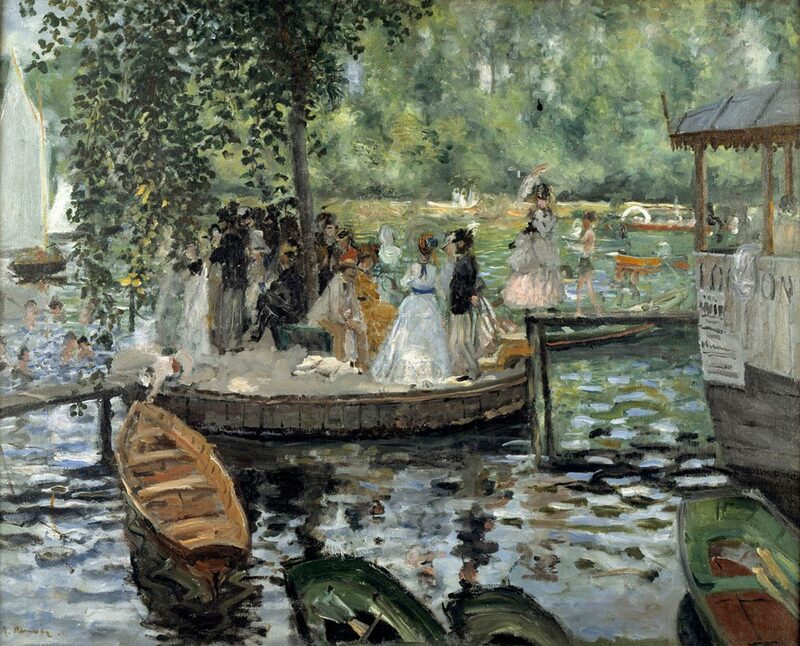 La Grenouillère by Renoir was created in 1869 and is currently on display at the Nationalmuseum in Stockholm, Sweden. It’s oil on canvas and is 66.5 x 81 cm in size. Both Renoir and Monet painted this particular piece individually. Both were poor when they created it and had the idea because they were so close to one another. La Grenouillère paints the picture of a pond with a crowd on a dock in the middle of it. There are green trees in the back, ripples in the water and small boats sitting beside the dock. There is a fairly large crowd standing on the dock; both men and women are dressed nicely as if they are attending a party. Renoir made each person individual even with the large crowd that is present in the area. The details in the piece are soft, with light being shown at the appropriate spots to create the perfect picture.